Charles Soule confirms the end of Star Wars: Darth Vader at NYCC 2018 – AiPT! 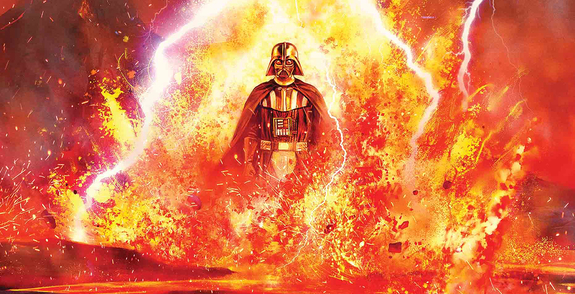 Charles Soule’s Darth Vader run will come to a close with this December’s Darth Vader #25. Following in the footsteps of the first volume of Star Wars: Darth Vader, Charles Soule’s second volume of the iconic character’s comic book series will end with December’s Darth Vader #25, Soule confirmed at the Disney-Lucasfilm Publishing panel at New York Comic Con. The series, which details Darth Vader’s exploits immediately following Revenge of the Sith, launched in June 2017 to both critical and fan acclaim. Soule has provided brand new canon and lore to the vicious Sith Lord more so than nearly any other comic book writer, save for Kieron Gillen (who wrote the first volume). While this may be the end of the ongoing series, Disney-Lucasfilm publishing also announced Star Wars: Shadow of Vader, a five part mini-series showing how different people in the galaxy perceive Darth Vader across all three eras. How do you feel about the ending of Darth Vader? Let us know in the comments below, and be sure to stick with AiPT! for all your NYCC news.